The lure of the local generates new solutions to new situational problems. The pixelgrain artists are seeking to evolve the language and purpose of their art to generate alternate narratives, knowledge sharing and social interaction in an expanding field using mapping technology, video and photo documents with the thematic networks of the web. Taking as their starting point the notion that history exists in multiple dimensions; as memory, as document, as personal recollection, as an event involving perception, the artists Michael Alstad and Leah Lazariuk have developed art projects around a historically specific, and particular phenomenon that is occurring in Canada’s West – the disappearance of that great icon of Canadiana, the grain elevator. The grain elevator is an immense, aesthetically elegant and formidably majestic structure. 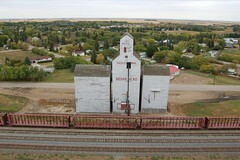 Since their initial appearance on the prairie horizon around 1900, the grain elevator has been the landmark par excellence of Canada’s western provinces. Canadian author Margaret Laurence with her typically acute sensibility called grain elevators “the churches of the prairies”. 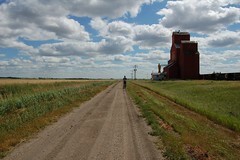 Using the evolving and adaptive technologies of our times, pixelgrain provides a virtual space that facilitates personal memory and accounts relating to the prairie grain elevator. A focal point for community, and likewise a symbol of Canada’s farm co-operative movement, of the Wheat Pool, the grain elevator was long considered essential for furthering the well being of community in northern countries, where social security, health care, and other social benefits were established under the aegis of Tommy Douglas after the lessons of the Great Depression. As Michael Alstad comments: “The motivation for pixelgrain stems from my interest in architecture, geography, public space and the social implications of new technology on our experience of place. I am interested in examining and ‘reworking’ official narratives and maps with personal recordings – pixelgrain expands on two previous projects, Teletaxi and Geostash, that I initiated with the Year Zero One collective. The Teletaxi projects utilised a GPS enabled computer/touchscreen in a mobile environment to generate video, animation, sound, and games triggered by specific mapped locations in an urban environment. Geostash was a project that combined a GPS/internet game with the Fluxus/Situationist inspired art-by-instruction practice that resulted in site-responsive performances and temporary works in public spaces throughout Toronto” These projects seek to develop technologies that work in the direction of site and specificity so that communities can re-establish closer cohesion using new technologies as a significant support and awareness structure within the broader matrix of facilities and services. 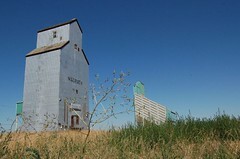 Using GPS to record the actual locations of disappearing, existing and threatened grain elevators, these intrepid artists have assembled a considerable repository of material, both visual and vernacular, that reflect what the grain elevator symbolized for generations of farm communities. Less well known is the fact that many of our society’s most progressive aspects, notably health care, and women’s rights as encouraged by the Suffragette movement, were phenomena generated largely in a rural context, and the progressive results of which have now become the bedrock of the Canadian national imperative. 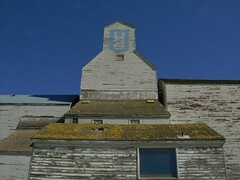 More practical information enables visitors to learn that ten percent of the grain elevators remain. 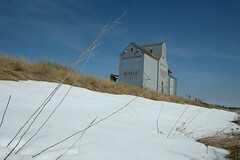 Although they are sometimes considered fire hazards, and an insurance concern, the surviving grain elevator is a heritage concern, and some should be preserved if only to provide examples for future generations of how their forbearers lived, and what the architecture of farm life was in the days of development in Canada’s west. Documenting the disappearing structures has enabled artists Alstad and Lazariuk to communicate the ways in which rural community are evolving through difficult transitions. 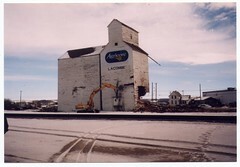 Some have adapted the grain elevator to other purposes, some are still deciding, while still others have had them demolished. 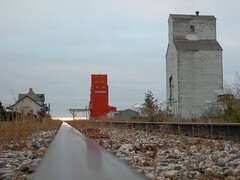 Using the network of the web, pixelgrain is evolving interactively with an audience that can access this found history, and likewise can contribute to the many layers of the grain elevator’s history. Geotagged videos and pictures on Google maps and Google Earth, as well as a series of interviews are but part of this universally accessible, free website. 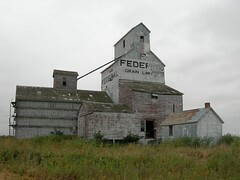 Contributors to pixelgrain have the capacity to add their own annotations about grain elevators in the form of text, photo and video. Thus pixelgrain is an ever expanding document about a feature of prairie society and community that reflects the broad changes that have taken place over recent decades. The visual and vernacular landscape of Canada has changed in part as a result of economies of scale. Just as monoculture, and the increasing consolidation of farm properties has sought to increase production, it has likewise forever changed the roots of our political and social structures. Questions are raised about the supply demand cycle, and who generates what and for whom. Canada's cooperative movement, its labour and credit unions could conceivably vanish in the future. And without some understanding of the forces that are affecting our lives, we may not be as able to chart the course of our future as a nation, and as a people.